Irish Dance TShirt Company gift cards will cover the *price of the product and even cover the shipping. The $25 card is perfect for one shirt and shipping anywhere in the US and other options are available. 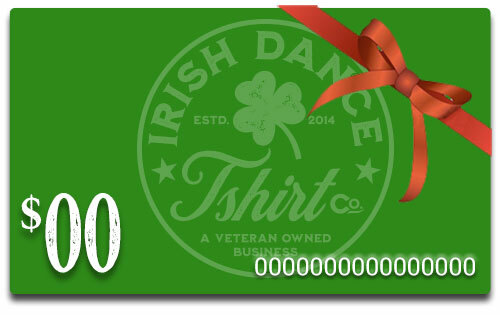 Looking for the perfect Irish Dance or feis-related gift but not quite sure what to give? How about a gift card? Please Note: E-Gift Card will be emailed to you or directly to the recipient within one business day of order processing. No hard copy of the card will be sent. *Product and shipping costs over the amount on the card will be the responsibility of the buyer. Any remaining card balance can be used on a future order. Only one gift card allowed per order.